9 December (Sunday) 8.30 a.m.
Route will start at Campal Ground and end at Azad Maidan (via Dona Paula). Prizes for the first three. 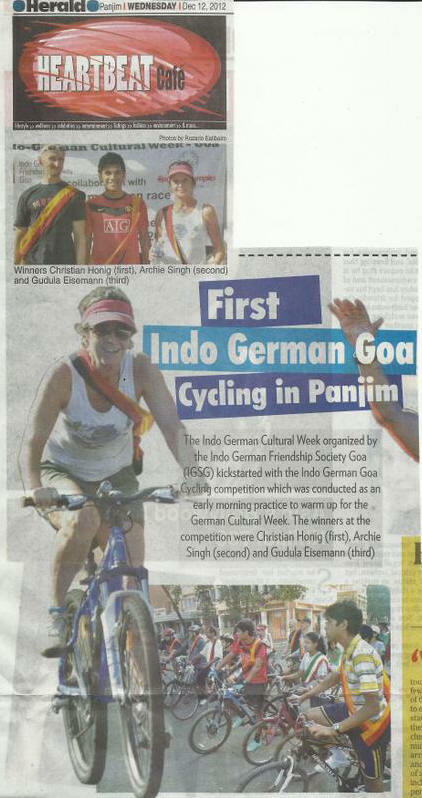 Cycle with us in an early morning practice to warm up for the German Cultural Week. Everyone welcome. Previous registration required. Please contact. 9 December (Sunday) 12.30 p.m. Built in the 19th century, every stone of this Pombaline Portuguese house tells a fascinating story of its colonial past. 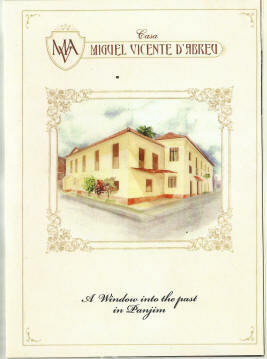 Miguel Vicente de Abreu (1827 - 1883) was a Goan intellectual and Provincial Associate of the Royal Academy of Science of Lisbon. Previous registration required. Limited number of participants. Please contact. 10 December (Monday) 9.30 a.m. Learn the traditional art of German pastry and how to make some of the famous traditional German cakes, such as marble cake, apple tart, almond cake and Linzer torte. Watch the German ladies prepare the cakes at a high-end non-professional pastry class. 10 December (Monday) 6 p.m.
Mr. Alexander Lorenz will present and comment the film. This is also a good opportunity for those who are interested in visiting the Chitra Museum one hour before the beginning of the screening. 11 December (Tuesday) 4.30 p.m.
Dr. Julião Menezes was a significant and serious contributor to Goan political thought and activism. He attended Berlin University in the 1920’s, graduated in medicine and took active part in the Indian Students’ Union in Berlin, along with Dr. Ram Manohar Lohia who was the secretary of the Union. 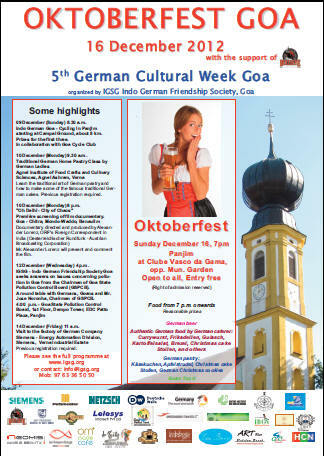 12 December (Wednesday) 4 p.m.
IGSG - Indo German Friendship Society Goa seeks answers on issues concerning pollution in Goa from the Chairman of Goa State Pollution Control Board (GSPCB). 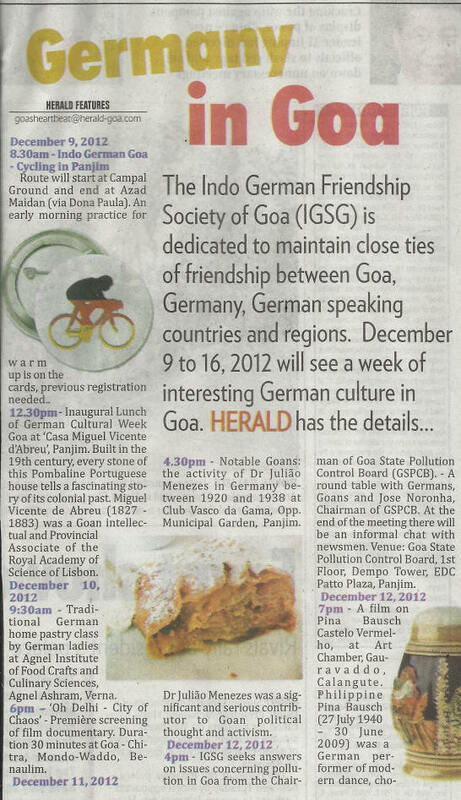 - A round table with Germans, Goans and Mr. Jose Noronha, Chairman of GSPCB. At the end of the meeting there will be an informal chat with Newsmen. Degradation of the environment is a growing concern in Goa. The discussion about this is endless and there is a myriad of plans trying to halt the degradation. But garbage problems, water pollution and mining pollution continue to increase and have practically no solution. Other countries and regions in the world with similar climate, economic development and social fabric have solved these problems a long time ago. Why not Goa? 13 December (Thursday) 7 p.m.
Philippina "Pina" Bausch (27 July 1940 – 30 June 2009) was a German performer of modern dance, choreographer, dance teacher and ballet director. With her unique style, a blend of movements, sounds and prominent stage sets, and with her elaborate cooperation with performers during the composition of a piece (a style now known as Tanztheater), she became a leading influence since the 1970s in the world of modern dance. 14 December (Friday) 11 a.m. The Energy Automation factory in Goa is the the first such factory outside Europe and third in the Siemens World, after Germany and United Kingdom. The factory started production just in 2012 and has been built as a green factory. It will produce a range of products for power distribution of industries, utilities and power plants. A Morning with Birds Observation in Goa. Bondla is home to over a hundred bird species. The park is predominantly covered with deciduous forests interspersed with evergreen forests. There is a great possibility of spotting brown fish owl, ruby throated yellow bulbul, Indian scimitar babbler and Oriental dwarf kingfisher among other exotic birds. Previous registration required. For registration and further information please call 9657959927. 16 December (Sunday) 7 p.m.
German beer and authentic German food made by German caterers: "Rindergulasch" (beef goulash), "Frikadellen" (German meatballs), Bretzel, “Currywurst”, Kartoffelsalat (potatoe salad), Sauerkraut (pickled cabbage), German pastry: Käsekuchen, Apfelstrudel, Christmas cake "Stollen", German Christmas cookies. 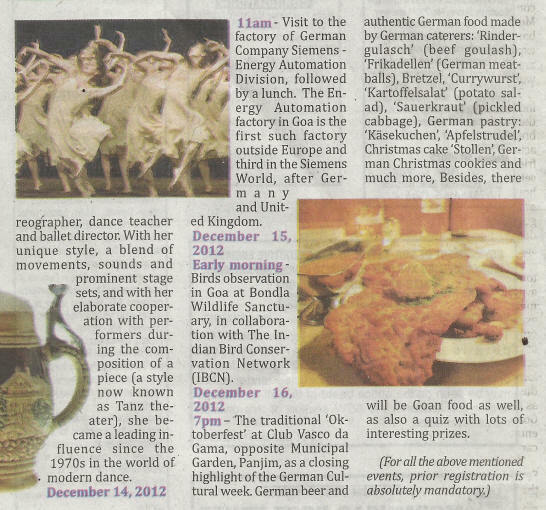 There will be Goan food as well. Quiz with lots of interesting prizes. Reasonable prices. Open to all, entry free (Right of admission reserved). Food from 7 p.m. onwards. "Oh Delhi - City of Chaos"
Notable Goans: the activity of Dr. Julião Menezes in Germany between 1920 and 1938.